Hand Stamped By Heather Wright-Porto: For Those Whole Like Dragonflies! For Those Whole Like Dragonflies! 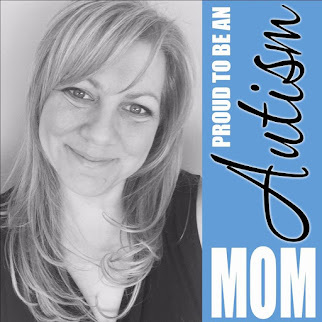 I am fortunate to be able to sell my cards at a few local gift shops, and there is a customer who has placed a few custom orders and loves dragonfly cards. I have created others in the past but forgot to take a picture of them (lol), but here are the latest two I created for them. 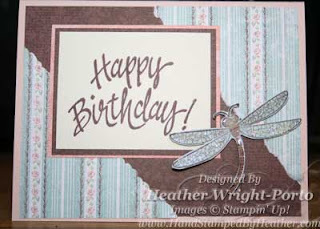 This card is made using the Dragonfly from Bugs & Kisses stamp set, Afternoon Tea Designer Series Paper (retired), Blush Blossom and Very Vanilla cardstock, as well as Chocolate Chip Classic Ink. Crystal Effects and Dazzling Diamonds were used on the Dragonfly (adhered to the card front using Stampin' Dimensionals). This card was created using patterned paper from the Bella Rose Designer Series Paper, the Organic Grace stamp set (retired, Hostess Level 1 set) and is rather simple. 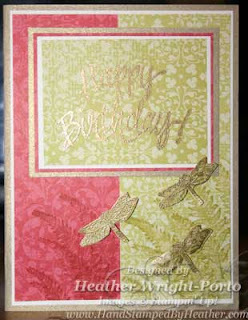 I used Gold Embossing to give it a little something, and to compliment the Brushed Gold cardstock used. If you like dragonflies, there will be more to come in the future since this particular customer orders regularly - wanting specifically cards with dragonflies.